You just finished your massage and you are handed a bottle of water and encouraged to increase your water intake for today. Why? 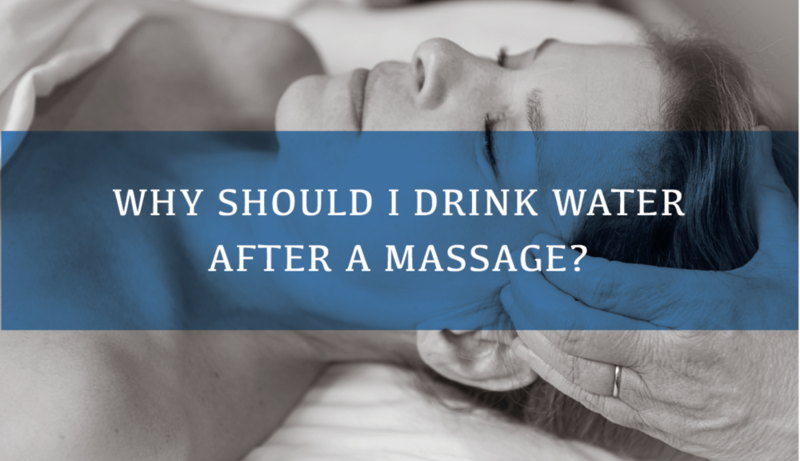 Why do you need more water today after your massage? The answer to this question isn’t as simple as it seems. Or is it? There are many therapists practicing massage that believe you need to drink water after a massage because you need to flush out toxins such as metabolic waste and lactic acid that have been released from muscles out of your system. The human body is an amazing thing and has a system in place to naturally rid itself of metabolic waste and lactic acid through its metabolic systems, excreting them through the kidneys and liver. A massage does not make these systems perform any differently or more efficiently than normal. There is no scientific evidence to support that drinking water after a massage removes any metabolic waste or lactic acid from your body. So if your kidneys and liver are functioning properly they do the work of removing unneeded wastes from your body. Drinking water after a massage based on this information is unnecessary. Massage is dehydrating, however, so drinking water after a massage is necessary to replenish the lost water. When receiving massage, your massage therapist is kneading the muscles in your body to release built-up tension and tightness. The manipulation of the muscles through long strokes or kneading, pumps fluids out of the muscle tissue and into your body’s circulatory system, where it ends up in your kidneys and is eliminated. Due to this dehydrating process, you need to replenish the lost water by drinking more. Your muscles will work and feel better when they are properly hydrated. Proper hydration is necessary for overall health and well-being. The human body is approximately 60% percent water and it is generally recommended that you drink 8 eight oz glasses of water a day. But water does more than just quench your thirst. It has numerous benefits to your health. •	Water is the main component of blood, which supplies cells with oxygen and nutrients and carries waste out of the body. •	Water regulates internal body temperature. Through the process of sweat production and evaporation, one’s body can avoid overheating. The blood on the skin surface is cooled, and it carries this cooling effect to the body’s interior. •	Water cushions vital organs. It makes sense to drink the water.